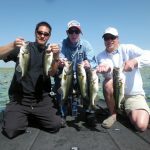 Much better day today fishing, Just 4 Bass was fishing for Okeechobee Fishing Headquarters / Bass Online. We caught 35 fish in 4 hours with shiners and a lot better size. Today I was Fishing with Roy Jensen, John Jensen and Philip Jensen. Here is a picture of the day.